Las Vegas has a ridiculous number of restaurants. We’ve got every type of cuisine imaginable, restaurants from just about every celebrity chef on earth, multiple Michelin-starred restaurants… the list goes on. Basically, we eat at a lot of great places. So, it can be a bit challenging to pick one or two meals that we thought were the best. Risotto al vino rosso at Lago, photo courtesy BiteandSwitch.com. I’m always a big fan of risotto so when I saw that this one was made with two of my favorite things ever – red wine and burrata – I had to try it. And I wasn’t disappointed. 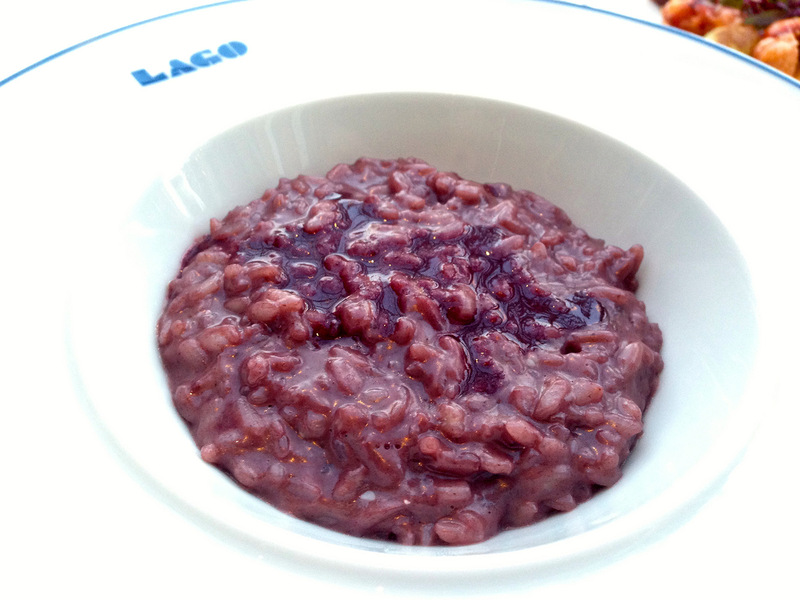 The risotto is delicious and has a beautiful red wine color with the creamy burrata cheese melting on top. The only thing that could top it is the view you’ll get at Lago while you’re eating it. The restaurant sits right on the lake in front of Bellagio and overlooks the fountains and the Eiffel Tower across the street. I was lucky enough to have a dinner at Rivea with a tasting of most of the dishes on the menu. 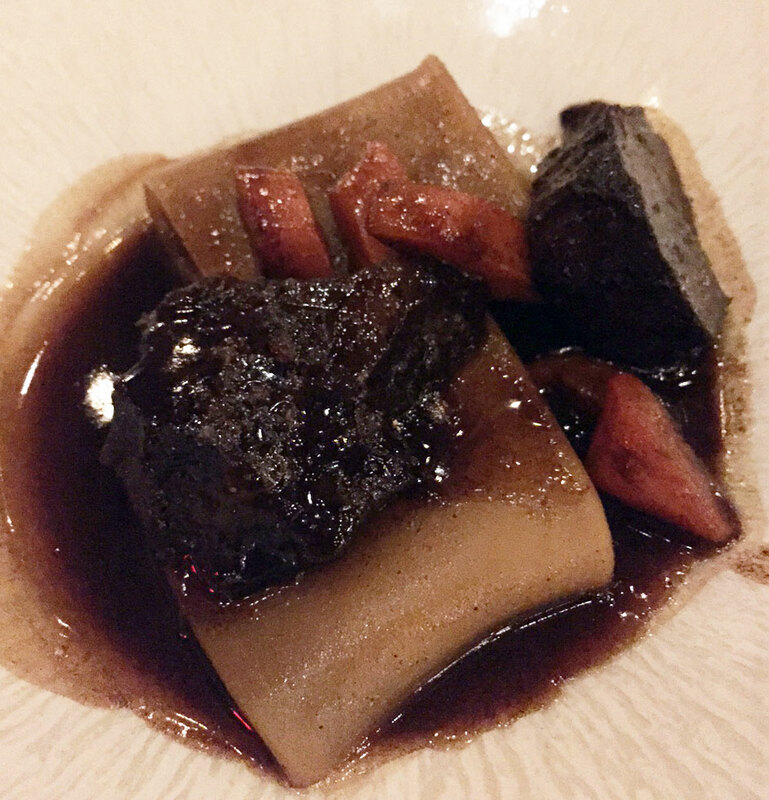 The one that had everyone at the table oohing and ahhing was the paccheri pasta with ox cheek and daube-style sauce that’s on the small plates menu. It’s a perfectly cooked pasta with tender meat and a rich, hearty sauce. Totally delicious. Wouldn’t expect anything less from Chef Alain Ducasse. Carbone’s signature spicy rigatoni vodka, photo courtesy of Carbone. The spicy rigatoni vodka is one of the specialties at Carbone. And for good reason — it’s delicious. 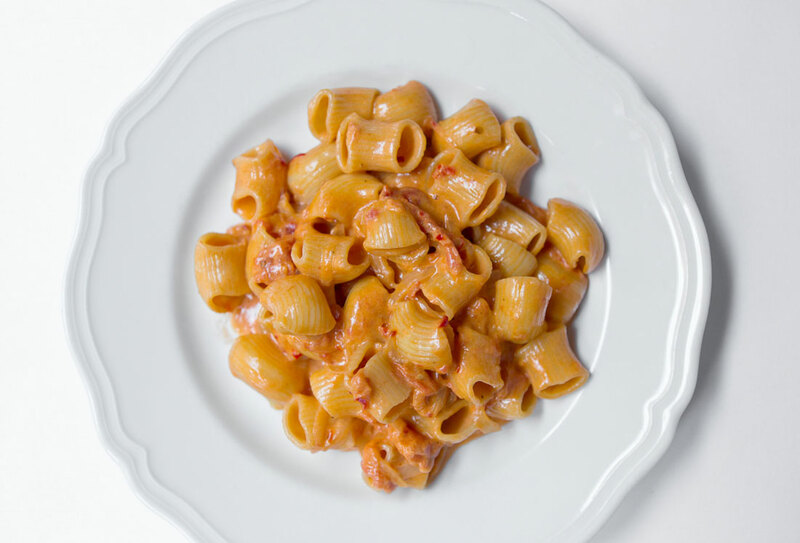 I always love a good pasta with vodka sauce and this one is done perfectly. The pasta is cooked al dente and the sauce is rich and creamy. If you like a little spice in your food you’ll love this. It’s got just the right kick to it. Pho at VegeNation, photo by Jeannie Garcia. In a town full of steak and seafood restaurants, VegeNation in downtown is a breath of fresh air. You’ve probably seen those videos of people eating vegan food for the first time, and it’s funny how they don’t ever show the yummy dishes we actually enjoy. I take my non-vegan hubby here and he loves it. 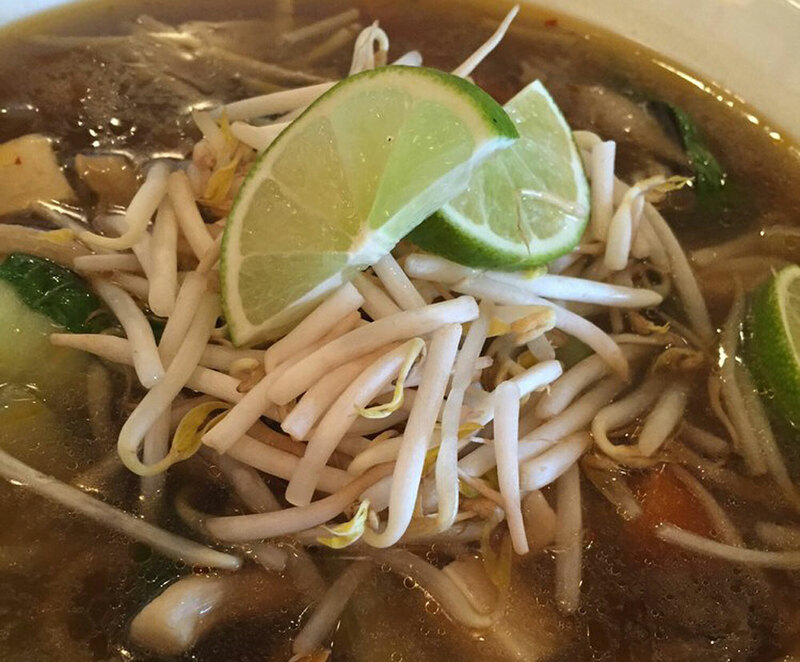 VegeNation has amazing pho (cleverly named Pho-King-Delicious) made with a savory mushroom broth. Even though VegeNation isn’t a Vietnamese restaurant, it still has one of the best phos I’ve ever tasted. Another favorite I get here is the restaurant’s My Little Dumpling – steamed shiitake mushroom and spinach dumplings with a tasty dipping sauce. Our only problem? We always eat our food so fast and before we know it, everything is gone. We’re also a fan of VegeNation’s weekend brunch items. The French toast (topped with fruits, syrup and a sweet cream) can easily pass for a gourmet brunch plate. I also love the bottomless cold brewed ice coffee and mango iced tea. I think if I had it my way, I’d eat here every single day. 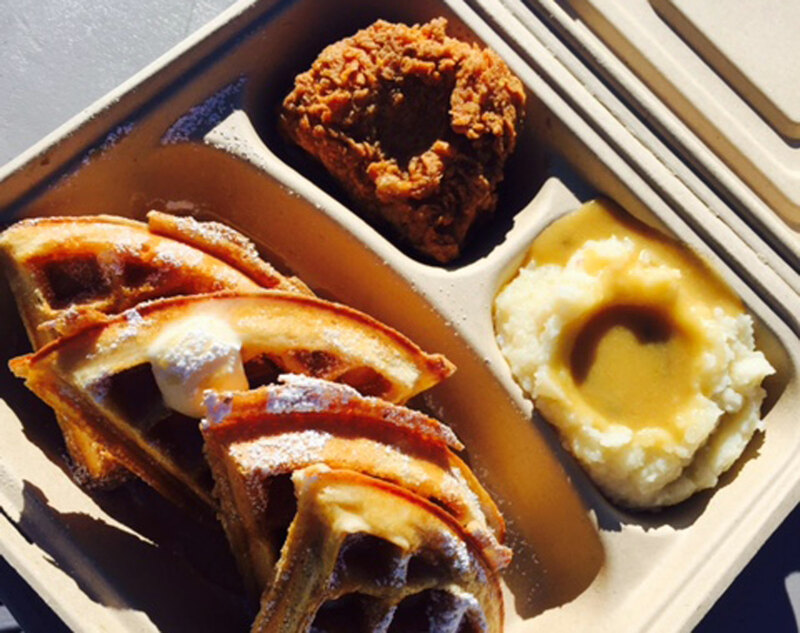 Garden Grill LV’s vegan Chick’n and waffles, photo by Jeannie Garcia. This joint really needs an actual restaurant / café location, but it’s one of the best vegan spots in town. Garden Grill LV only pops up at local farmer markets three times a week: Bruce Trent Park on Wednesday (2 p.m – 6 p.m.); Tivoli Village on Saturday (9 a.m. – 2 p.m.) and Sansone Park Place on Sunday (8:30 a.m. – 1 p.m.). It’s worth the drive because the food is honestly that good. My favorites this year include The Thrillest (vegan Southern fried chick’n, vegan bacon, vegan cheese, chipotle aioli, lettuce and tomato sandwiched between two vegan Ronald’s doughnuts) and the oh-so-delish chick’n and waffles (vegan Southern fried chick’n, mashed potatoes and gravy and the super thick and fluffy waffles). Other favorites include the beer-battered mushrooms and the Philly Cheeze Steak sandwich topped with a vegan mozzarella-style sauce. Before I became a veggie head, my favorite cuisine was soul food. So Garden Grill LV is the answer to my vegan prayers. Hallelujah! Photo courtesy of Le Thai. What is the best thing I ate this year in Las Vegas? Well, if that’s not the year’s most difficult question, I don’t know what is! Here in Vegas we are so lucky to be surrounded by top-quality, worldly cuisine on and off of the Strip so, while we were asked to pick our favorite, I am going to have to call this one a tie between Le Thai located downtown and The Great Greek located in Henderson. In my opinion, Le Thai is home to the best chicken pad Thai in Las Vegas. 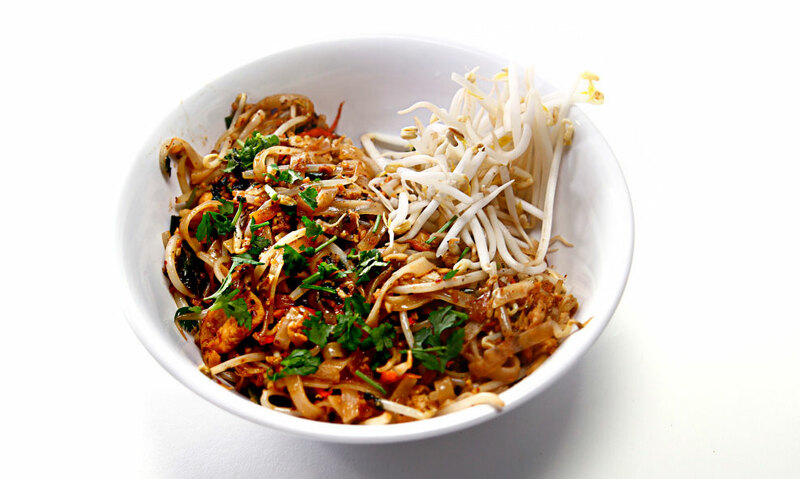 With a spice range of zero to five (five being the spiciest) I like to order my pad Thai at a level three with a side of peanut sauce… because peanut sauce is amazing. The best part about this meal is that the dinner portion is big enough for two so you can either split it with another person or have leftovers to take home for another helping. Similarly, I am happy to say that this year was a year of Greek food for me after I discovered The Great Greek Mediterranean Grill in Henderson. My favorite thing to order is the Greek rice bowl with chicken and extra tzaziki AND SOME Sriracha sauce… I am certain that I could eat this for every meal for the rest of my life… yes, it is that good. I also love the ambiance of this restaurant. This authentic mom and pop shop operated by a Greek family is definitely a place off the beaten path that you must dine at during your next Vegas vacation. 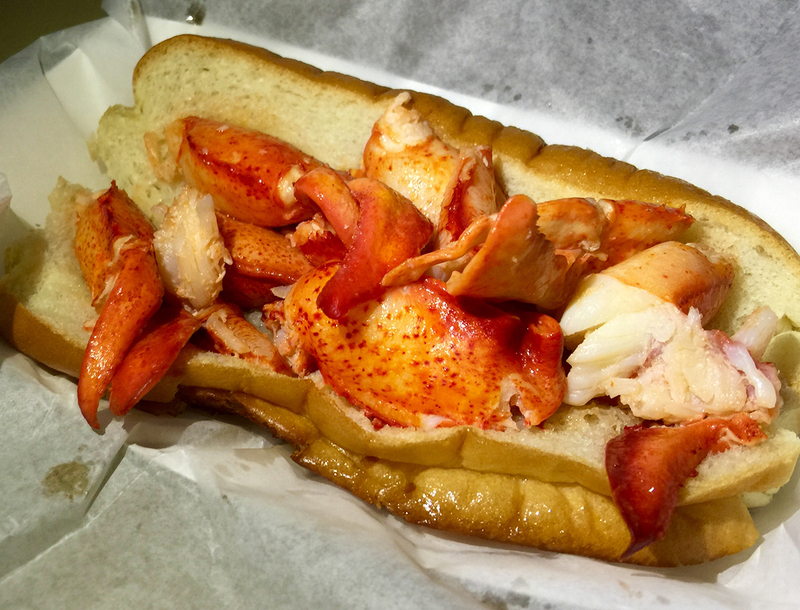 Connecticut lobster roll, photo by Ashley Oñoz-Wright. The best thing I ate this year was the Connecticut lobster roll from a food truck at the Great American Foodie Fest called Cousins Maine Lobster. So many times, people throw in a bunch of ingredients on a lobster roll that really mask the flavor of the meat. This sandwich was exactly the opposite. Nothing fancy, just the tender succulent sweetness that is a Maine lobster, bathed in a warm silky coat of butter. The hoagie was flaky on the outside, but warm and soft on the inside. Just the right amount of bread to soak up the butter but not so much that it felt like your mouth was stuffed with cotton. For 16 bucks I got more heavenly meat than I’d find at a high end restaurant for twice that price. These guys know how to do lobster right. I got to check out Itsy Bitsy Ramen and Whiskey for a beer tasting event. That was my first time, but I’ve been back several times since. The concept is simple and delicious. 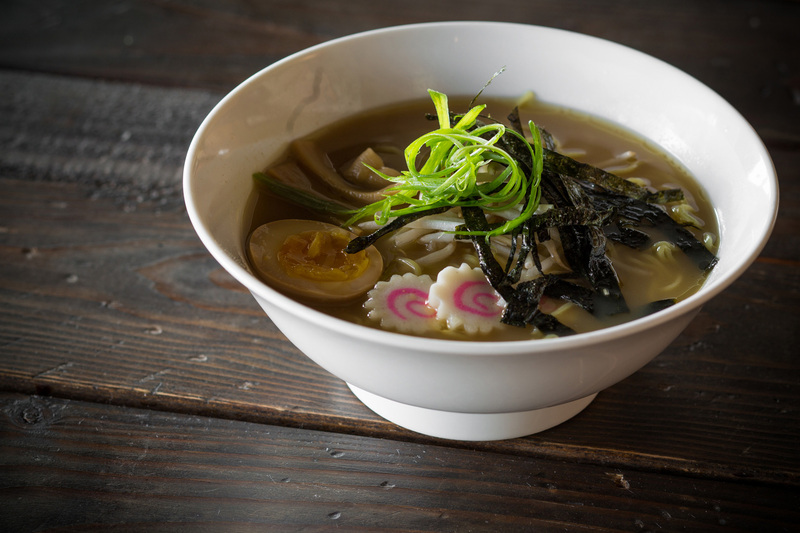 It’s a ramen house downtown that likes to pair ramen with whiskey – a fantastic combo if ever there was one. It’s also a combo that lends itself relatively well to a vegan diet, which I had at the time. When I mentioned to the server that I was vegan, she knew exactly what that meant. That may sound like a small wonder, but when you’re a vegan you learn to knock your expectations pretty low when you try a new restaurant. Even if my expectations had been at their peak they would have been shattered by the delicious bowl of miso ramen with rice noodles, tofu, broccoli, bean sprouts and just a hint of spicy chili oil. About halfway through the meal the chef came out to make sure I and the other vegan person at the table were enjoying his special creation, and we assured him we were. Now, keep in mind, I already knew the chef and I have the whole Vegas Insider thing going for me, so you probably shouldn’t expect that. But it really means something, whether you’re a vegan or not, when the chef takes special care to ensure you have a wonderful meal. I’ve been back several times since. It’s one of my go-to spots with my omnivore girlfriend, and I have it on good authority that the meat options are just as scrumptious. But I love this place because it’s down to earth yet elegant, hipster but not ostentatious and I always have a fantastic meal. And I highly recommend it this time of year. A hot bowl of ramen is even better when it’s chilly out. The breakfast cannoli donut, photo courtesy of Carlo’s Bakery. I’ve been addicted to cannoli since I tasted my first one as a 12-year-old at a church holiday bake sale. That sinfully good treat was created by a little old lady who was probably someone’s nonna, but all I knew was that she was selling pastry paradise. I’ve been trying to match that experience since. Enter Carlo’s Bakery at the Venetian. Yes, Buddy Valastro sells his cannoli there and they’re good, but the real winner is the cannoli donut. Say hello to sin on a plate. 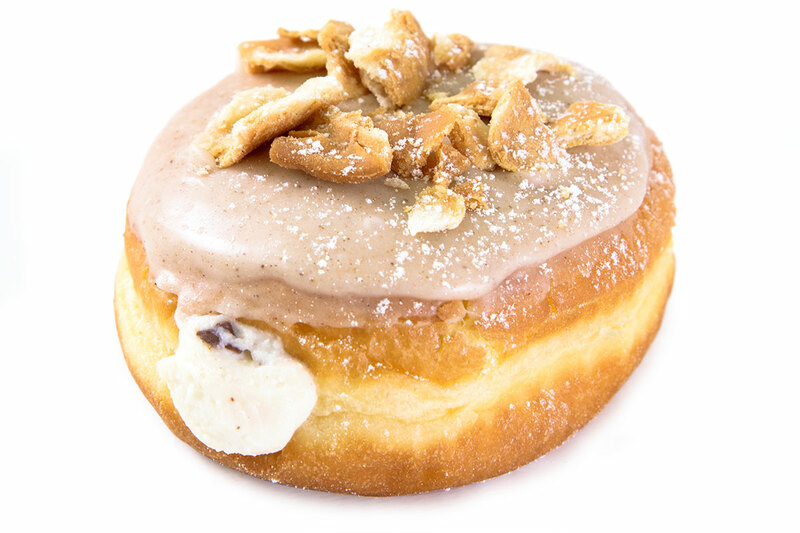 The gooey ricotta and sugar filling with just the right amount of chocolate chips is surrounded by a donut topped with a glaze that contains a hint of cinnamon and crushed cannoli shells on top. I’m salivating just writing about it. Take a dozen donuts home and you’ll have broken the second deadly sin before you even exit the car. Crap, now I’ve gotta go to confession.